The government’s mistrust of local communities is so strong, it’s underwriting the miseducation of a whole generation. While the national political spotlight has faded from Mississippi since the primary vote, its poorest families are now getting the wrong kind of attention from Washington: The US Commission on Civil Rights has issued a scathing report detailing how both childcare providers and families are systematically cheated out of their entitled social welfare resources. So the state, one of the poorest and blackest in the union, was actually shoving the burden of education cuts onto the very children it was supposed to educate. Community advocates point to tragedies like Mississippi in calling for a dramatic overhaul of the deeply under-resourced federal childcare block grant system, which currently subsidizes more than 1.4 million kids. But Congress seems tone deaf to the families’ outcries. Last month, lawmakers introduced legislation called the Child CARE Act, which aims to guarantee low-income families’ access to affordable, quality childcare by ramping up funds allotted to states, focusing on enhancing services for infants and toddlers, and the most disadvantaged children and communities. And the proposal would expand services during “unconventional hours,” to accommodate the “on demand” scheduling now common in low-wage sectors. The legislation has scant chance of moving in this Congress, but it sketches out a vision for childcare as an entitlement for working households, not a luxury. Will the next administration take early childhood seriously? Both Sanders and Clinton have included childcare and preschool in their platforms, though their policy proposals remain vague. Clinton has not presented a detailed plan, but has proposed instituting universal pre-K phased in over several years, and has floated the idea of promoting subsidized childcare through “a mix of tax relief and new federal spending,” along with a roughly $2 billion a year investment in Early Head Start. A few years ago, Sanders sponsored legislation to launch a pilot initiative in several states to develop programs that would “provide all State residents with the opportunity to enroll children, ages 6 weeks to kindergarten, in an early care and education program on a full time basis.” The programs would include partnerships with social service and healthcare providers. Crucially, like many of Sanders’s other proposed social programs, it is universal, whereas the CARE Act would focus specifically on low-income families. Sanders has gone further than other lawmakers in emphasizing the workforce side of childcare, promoting enhanced professional training programs to cultivate specialists for children and toddlers, English language learners, and children with special needs. The newly proposed CARE Act, targeting working poor households, would provide annual grants ramped up incrementally over five years from $3.6 billion in 2017 to $6.9 billion by 2021. Though the CARE Act doesn’t guarantee a specific pay grade, the legislation mandates periodic studies to assess compensation levels to help “ensure fair and competitive compensation” levels that would “attract, support and retain providers” with the capacity to provide a healthy “stimulating, warm and responsive” classroom environment. That sounds like a lavish guarantee but it’s every child’s right, and every teacher’s professional entitlement. None of the proposals currently before the electorate or Congress would go all the way toward providing fully universal childcare yet, much less a fully equipped, sustainable early-childhood workforce. 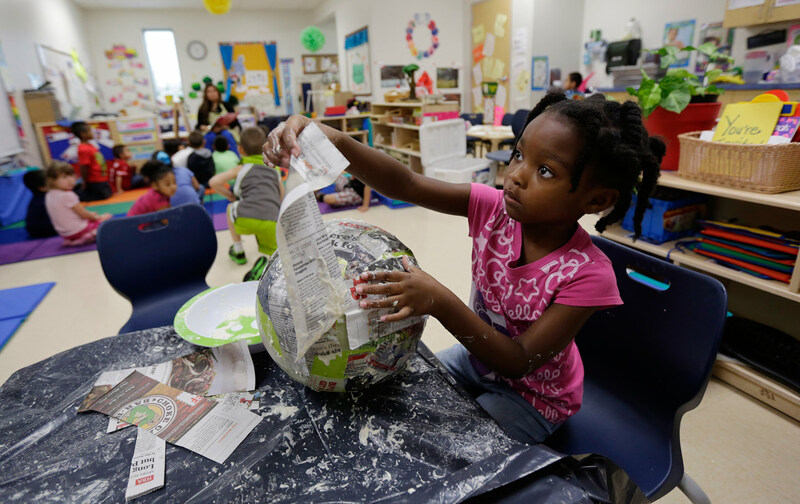 But slowly, a progressive consensus is crystallizing around the need to treat universal early education as a social ecosystem—not just developing the whole child, but also creating more connected communities. Without support for both families and educators, we get disasters like Mississippi, where the government’s hostility and mistrust of local communities are so strong, it ends up underwriting the miseducation of a whole generation.